Adams, A., Guindon, K., Horodysky, A., MacDonald, T., McBride, R., Shenker, J. & Ward, R. 2012. 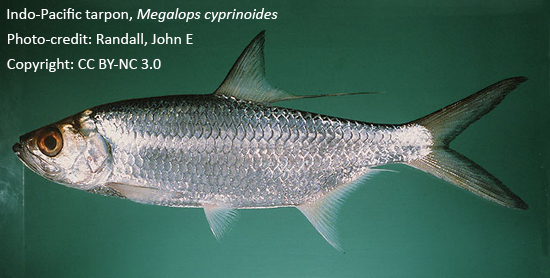 Megalops cyprinoides. The IUCN Red List of Threatened Species. Version 2014.3. Downloaded on 15 January 2015 and from http://www.iucnredlist.org/details/166868/0. Bleeker P (1851) Over eenige nieuwe soorten van Megalops, Dussumieria, Notopterus en Astronesthes. Natuurkundig Tijdschrift voor Nederlandsch Indië 1: 417-424. Bleeker P (1866) Sur la pluralité des espèces Indo-archipélagiques du genre Megalops Lac. Nederlandsch Tijdschrift voor de Dierkunde 3: 278-292. Broussonet PMA (1782) Ichthyologia, sistens piscium descriptiones et icones. Decas I. London. Ichthyologia, sistens piscium descriptiones et icones. Decas I.: 49 unnum. pages, incl. i-iv., Unnum. Pls. 1-11. Castelnau FL (1878) Australian fishes. New or little known species. Proceedings of the Linnean Society of New South Wales 2(3): 225-248, Pls. 2-3. Hossain MA and Sultana N (2009) Lepidocephalus berdmorei (Blyth, 1861). In: Ahmed ZU, Ahmed ATA, Kabir SMH, Ahmed M, Begum ZNT, Hasan MA and Khondker M (eds.). Encyclopedia of Flora and Fauna of Bangladesh, Vol. 23. Freshwater Fishes (In Bangla). Asiatic Society of Bangladesh, Dhaka. pp.6-7. Lacepède BGE (1803) Histoire naturelle des poissons. Histoire naturelle des poissons. v. 5: i-lxviii + 1-803 + index, Pls. 1-21. Rahman AKA (1989) Freshwater Fishes of Bangladesh, 1st edition, Zoological Society of Bangladesh, Department of Zoology, University of Dhaka, Dhaka-1000, pp. 234-236. Rahman AKA (2005) Freshwater Fishes of Bangladesh, 2nd edition, Zoological Society of Bangladesh, Department of Zoology, University of Dhaka, Dhaka-1000, pp. 259-260. Richardson J (1846) Report on the ichthyology of the seas of China and Japan. Report of the British Association for the Advancement of Science 15th meeting : 187-320. Talwar PK and Jhingran AG (1991) Inland Fishes of India and Adjacent Countries, Vol. 1, Oxford & IBH Publishing Co. Pvt. Ltd. New Delhi-Calcutta, pp. 69-70. The great thanks goes to the photographer named Randall, John E. (India) of an added image which was uploaded to FishBase previously by him under the following copyright: CC BY NC (Image can be freely copied and altered, as long as original author and source are properly acknowledged). Visited 804 times, 1 visits today | Have any fisheries relevant question?